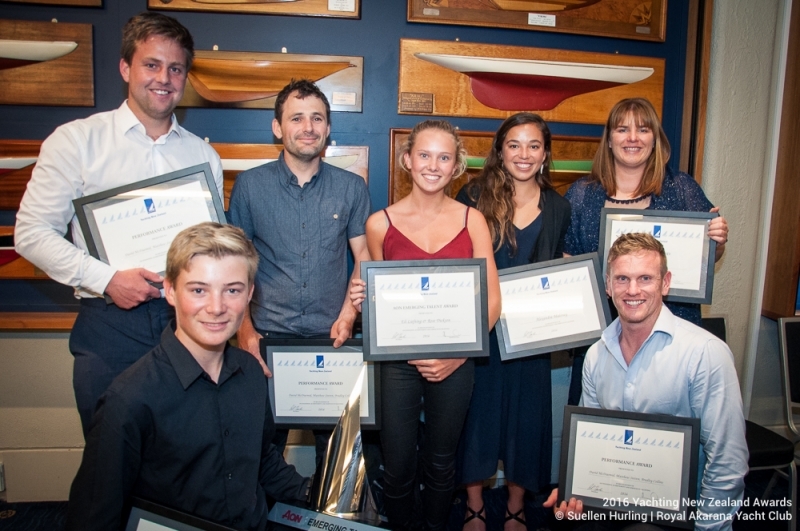 The 2016 Yachting New Zealand Awards was held on Friday 25th November, and Royal Akarana Yacht Club members were featured throughout the categories. Eli Liefting and Rose Dickson, who won a Youth Performance Award for their achievements in the RS Feva class locally and international, were also named as the Aon Emerging Talent winners. Eli and Rose have excelled in the class and won the National Championship as well as placing 4th at the Worlds in Spain. The award was a huge shock to Eli and Rose, who were in a category with some of New Zealand’s top youth talent. Alex Maloney and Molly Meech, who won Silver at the Rio 2016 Olympic Games, were given Life Time memberships to Yachting New Zealand, as well as winning performance awards. Alex and Molly based themselves from RAYC during their Olympic campaign and were the toast of club when they crossed the finish line of the nail biting medal race, which secured them with the podium finish. 18′ Skiff sailors David McDiarmid, Matthew Steven and Brad Collins were acknowledge with performance awards for their outstanding achievements in the class locally, in Australia and their results in Fiji. The crew from Yamaha finished second at the JJ’s which is considered the intergalatics of 18′ Skiff racing, the best result from a Kiwi boat in 42 years. They showed dominance once again over the Australians during the Mark Foy World Championships in Fiji in July, winning the regatta outright. MC for evening Peter Lester said that it was great to see the 18′ Skiffs come alive on the Waitemata Harbour. Matt Steven, David McDiarmid and Brad Collins. Commodore Sally Garrett was presented with a Service Award for her tireless work with offshore safety standards. Sally has worked alongside Yachting New Zealand to tailor the safety standards for offshore racing and has ensured that RAYC leads the way in this field. Sally was also recognised for her great work with the ANZ Sail Fiji race and her continued efforts to promote offshore racing to the masses. It was a very successful evening for RAYC and it’s been some time since members have been on the stage winning these prestigious awards. The club has revamped it’s image over the last few years and is now considered a big player for both youth racing, off the beach, high performance and long distance keelboat racing.